Find a Cute Breastfeeding Cover That Fits Your Style! There are some moms who couldn’t care less about covering up with a breastfeeding cover, blanket or anything else for that matter, while nursing their babies in public. They figure they aren’t doing anything immoral or illegal. Breastfeeding is natural, so why should anyone care? And they are right! And then there are those who are very discreet, maybe even shy, about nursing in public and would prefer to cover up while doing it. Which is understandable, since your breast is being a bit exposed. So it’s okay to feel like that too! • Cover your baby up with a blanket. Which will probably make your baby sweat immediately (that’s what happened to my baby), and you'll also have to keep adjusting it to make it stay on your shoulder while you nurse. 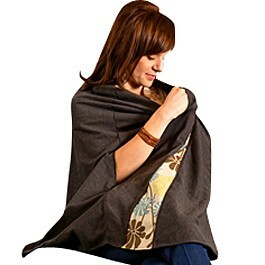 • Choose the more comfortable and cute option--a breastfeeding cover. Which is actually a bunch of choices in itself, which is why I’ve broken it down into bite size chunks for you. This cover is so cute and classy! It's the one see in the top picture. It looks like a beautiful shawl, covering your front and back while you nurse. It also comes in other colors! Now this is what I call discreet nursing! It is made where the only part of your breast that is showing is the part your baby is nursing on, and that part is in his mouth! So really, none of your breast is showing! This is the only nursing cover that I know of where you don’t have to put anything over your baby’s body. And 9 out of 10 times, most people won’t even know that you’re feeding your baby. They will think he is asleep! It’s for the baby to wear! You put this big brimmed hat on your baby when you’re breastfeeding in order to get a little privacy. This cover up is too precious! And easy! Out of all the nursing covers, this is the only one that I know of where you don’t have to wrap or tie anything around your body. Just put this hat on your baby and get to nursing. I love it! Here you will find a nursing cover in a variety of patterns. Choose the one you like! As you can see, breastfeeding covers can be fun and whimsical like the breastfeeding hat, or a little more contemporary, like the ModestMomz breastfeeding poncho.